WHITEHOUSE STATION, NJ — As technology is paramount in providing convenience and accessibility in the fast-casual food industry, QuickChek is once again among those leading the way. On the whole, mobile ordering is more popular than ever according to the 2017 Online and Mobile Ordering Index, which found that two-thirds of fast-casual customers plan to order online in the coming year, up from 58% of customers who ordered a meal via a website or mobile app in the past year. A market leader with an exceptional fresh coffee and fresh food program offering restaurant-quality food at value prices, QuickChek notes the increased usage in its mobile app is being driven by mobile ordering, app-only offers, and QuickChek Bubble Pop/Spin & Win games with new prizes added on a regular basis to further engage with its customers. Named makers of the best coffee in America in a national consumer survey, loyal customers are also rewarded with a free coffee after they purchase six and scan the Power Perks section of their QuickChek mobile app in store. The 2016 National Convenience Store Chain of the Year has been at the forefront of technology implementation, receiving numerous innovation awards from the convenience industry as it continues to meet the changing needs and habits of today’s consumers while enhancing customer experience and loyalty. QuickChek began using touch-screen kiosks enabling consumers to customize their orders 24-hours-a-day in 2006 and in 2009 it was the first in the industry to introduce self checkout counters in its stores. Durling also noted that consumers receive coupons and messages on the company’s latest deals and promotions through the mobile app, allowing them to save money daily. 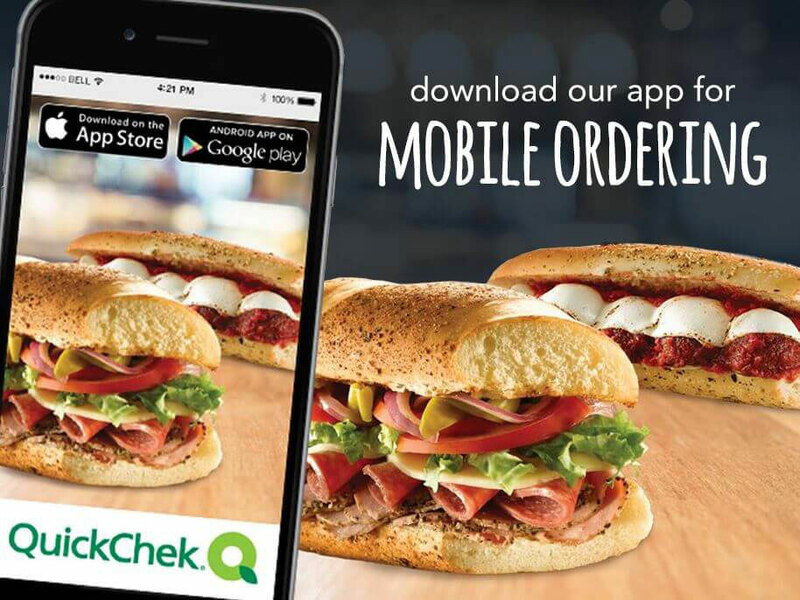 Consumers can order custom-made sandwiches, wraps, salads, breakfast items, specialty espresso drinks, lattes and fruit smoothies through the QuickChek mobile app between 5:00 a.m.-10:00 p.m. and select their desired pick up time at any of the company’s 154 locations throughout New Jersey, New York’s Hudson Valley and Long Island. Orders will be prepared to coincide with the time of pickup, ensuring freshness and correct temperatures. Upon entering the store, customers can pick up their mobile order at the designated area, select any other items they wish to purchase, pay, and be quickly on their way. To download the app or to learn more, visit www.quickchek.com.